There isn’t a more important subject to speak about than the centrality of the aerosol program to the workings of the New World Order agenda. 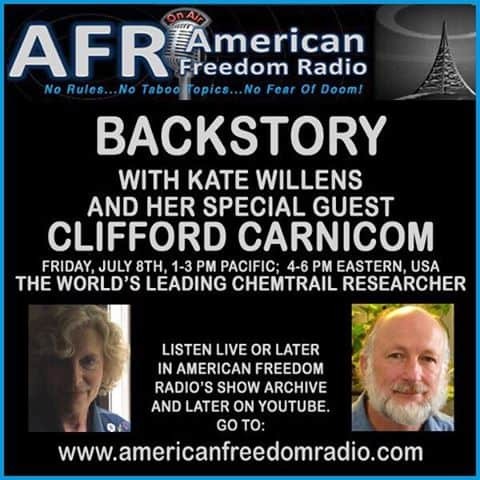 In this mind-bending interview, Clifford Carnicom, the dedicated scientist and researcher who has spent the last twenty years serving the public good, speaks about the organism which he has uncovered everywhere, in all the kingdoms of nature, and within human beings. This organism crosses the domains of natural biological classifications, and has made a ‘new biology’ within us. It is at the heart of The condition known as Morgellons, a condition not limited to those with the dreaded skin condition. Carnicom speaks of the necessity for the public to pick up on the research he has done, and run with it, using it to fight for the natural world that is our birthright, for the sake of all life now and to come. We had a surprise visit in the second hour by Elana Freeland, a great researcher and author in her own right, who has worked closely with Clifford. Having them both in discussion as to the meaning of it all, was mind bending in the extreme! Please visit carnicominstitute.org to keep abreast of current research, and give as generously as you can to support this crucial work of our times. You can also follow CI on Twitter and Facebook.